Funny, Adult, Perfect for the holidays! Enjoy!!! These are the best Christmas Cartoons / Holiday cartoons that were received by me over the past few years. I will describe exactly what is going on for the morons who can't figure cartoon jokes out. 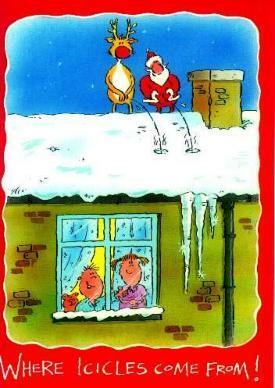 When Santa and his reindeer are full from all that water you kids leave behind they like to relieve themselves on your roof. The clear pee freezes before it hits the ground, forming icicles from your roof. Give me some feedback at santajokes@jokebomb.com to let me know which you like best.